I swear. I look around and realize that I have, suddenly and frightfully, reached the depths of un-sophistication. Ok, I’ll be honest, maybe not so “suddenly”. But most definitely frightfully. I was puttering around one morning, organizing my shoes (puttering?? organizing my shoes?? Why am I not out changing the world? Or at the very least sipping a gin &amp; tonic at that swanky new place? ), and I realized…they are all flats! I have nothing against the occasional ballet flat, especially in animal print, but to go from stilettos to 99% flats is a bit troubling. That’s not even to say anything about my shameless stay-in-bed fixation, cold a/c and soft warm duvet, ratty pyjamas and e-reader. And the difficulty in which I drag myself to wear make-up, or at least get myself some proper cleanser and moisturizer for my face (although I have to share, I am getting better in that department…in small increments, Rome wasn’t built in a day after all!)! And the supermarket fetish. Oh the supermarket fetish. Since when did this pass for a respectable after-office event? What happened to happy hour?? In truth, I’ve always loved going to the supermarket, I think from the very vestiges of my early memories, when my mother took me. I remember standing in the midst of the butchery section taking it all in and loving it (yes, I loved the meat section as a child). I, of course, also remember the treats she would allow me to place in our cart, only one per trip. My favorites were Yan Yan and those little packets of Nutella, the kind that came with it’s own little spoon. My whole family has this supermarket obsession I suspect, so it’s not just me on this point of nerdiness. How do you explain my husband so willingly taking me most of the time? It can’t be just that he’s a good husband (although he is I promise you! )…and I know this because of the Spam and Vienna sausage and cup-noodles that mysteriously appear in our cart whenever he is pushing it. Little C loves it too, primarily because of the treat – I’m continuing my mom’s tradition (choose just one sweetie!). Little H couldn’t care less at the moment…as long as there are possibilities for wrecking havoc then he is happy. And what do I sneak in the grocery cart? Lately it’s been more items to complete my Asian pantry: Shaoxing wine, soy bean paste, various chili pastes (speaking of, can anyone share where to get some good doubanjiang?) and chili oils, that savory sweet condiment Kecap Manis, which I used to make this. – If you want to do the tenderizing step, sprinkle the baking soda on the chicken and toss with your hands to coat. Let this marinate for 10 minutes then rinse thoroughly with water. Make sure all the baking soda is completely rinsed off. Pat the chicken pieces dry and set aside. – Heat up a clay-pot (if you have one) or a wok over high heat, and then add the sesame oil. Add the garlic and ginger to the oil and stir-fry until aromatic. – Add the chicken to the pan and stir-fry for a couple of minutes. 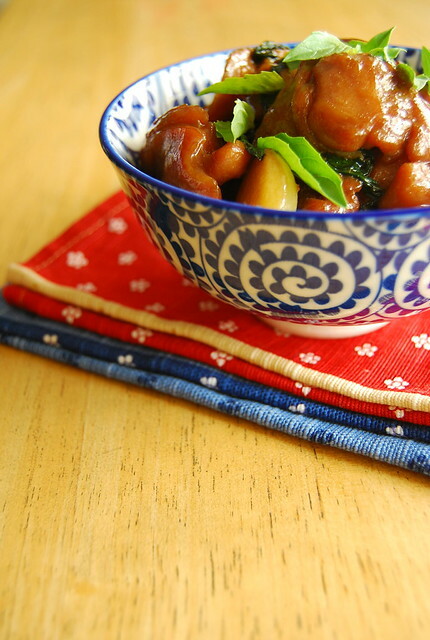 – Add the soy sauce, Shaoxing wine, and Kecap Manis and toss. Lower the heat and let this simmer for about 5 minutes or until chicken is just cooked through. – Add the basil leaves, toss, and then remove from the heat to serve. A word on tenderizing the chicken with baking soda: One of the reasons I love Bee of Rasa Malaysia so much is because she makes Chinese cooking so accessible to the regular non-Chinese cook (i.e. me). This includes such tips and tricks as this tenderizing one. 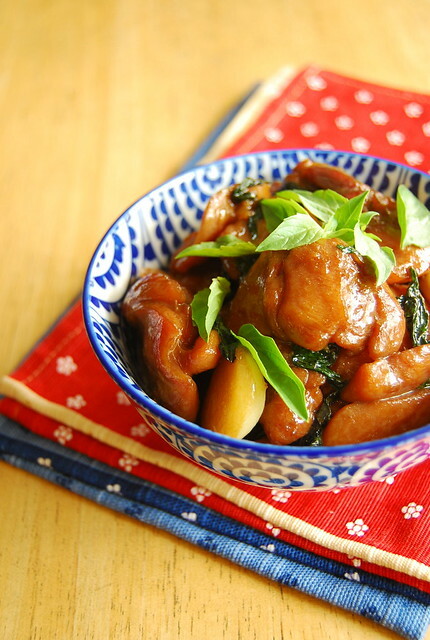 Giving chicken, beef, or pork this relatively quick and easy to do treatment renders them soft and velvety, just like the ones you get in Chinese restaurants. It’s marked as optional, but I’d say it’s worth the (tiny) effort. I didn’t have any chicken drumsticks so I used thigh fillets instead. I also couldn’t find any dark sesame oil so I use my Korean brand of sesame oil, instead of my Chinese brand one, as it seems to have a stronger sesame aroma. I have no idea if that is even true in actuality but since I had the choice, and the recipe called for “dark” sesame oil, I just opted for the stronger one and hoped that would make the difference. In any case, the dish turned out delicious (clean plates from both kids) but as I’ve never had dark sesame oil I would be none the wiser of the difference. You can be sure though that “dark sesame oil” is going on my next Asian ingredients run since we now know I will use any excuse to go to the grocery. I think I’ll stand by this supermarket fetish. It gets us fed to say the least. Hopefully, it will make for some happy family memories as well…just as it did when I was a little girl, mesmerized by the sight of mountains of raw meat, munching on Yan Yan. I’ll also be keeping the burrowing in bed habit – love that way too much to ever let go! I will make it a point though to have more high heels in my life…a girl’s gotta do what a girl’s gotta do after all. I've always used the baking soda trick, but didn't know about having to rinse it off. Yummy recipe. Hi Midge! I really need to plan a trip to Chinatown one of these days if I want to get the good goods! I love the tips about tenderizing the chicken with baking soda!